Out of the Ark Music provide award-winning singing resources to over 18,000 primary school and early years settings across the U.K. We now offer outstanding CPD training aimed at every teacher in every school. Out of the Ark Music provide award-winning singing resources to over 18,000 primary school and early years settings across the U.K. We now offer outstanding CPD training aimed at every teacher in every school. There are currently 4 workshops to choose from. These can be delivered directly to schools or via Music Hubs’ conferences or events. This newly updated series has provided enjoyment and inspiration for many years. 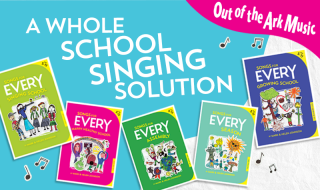 Tried and tested songs continue to have a hugely positive impact upon countless schools and children everywhere, and our belief in their values and potential has led us to produce this refreshed and updated version of the series that gives you a whole lot more. 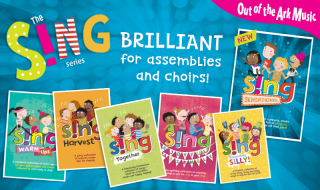 The fabulous new S!ng™ Series from Out of the Ark Music is designed to get your school singing about almost anything and everything! 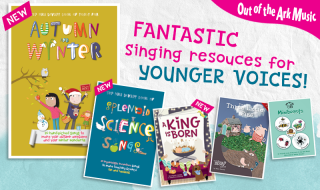 Out of the Ark Music provide the very best singing resources to primary schools and early years settings in the UK. Specialising in creating memorable, age appropriate, catchy songs which are fun and easy to sing, and that children just love!